randymajors.com: Unexpected Name-Change Brick Wall Busted! WHAT A STORY!! Congratulations on your rewarding find! Your perseverance inspires me to retackle a couple brick walls of my own!! Thanks for writing, and thanks for joining the geneablogger community! This is a great story! I specialise in using unusual sources that overcome 'dead ends', and I often find that a name change occurs when someone has committed bigamy, or deserted a wife, child or an illegitimate child, or spent time in prison or a mental asylum. My Web site describes some of the records that I have used. Excellent, excellent job!! I love when the brick walls are finally overcome. One gets a wonderfull feeling of accomplishment. Thank you for sharing. Fine job of research and writing, Randy. I'm convinced. It would take a fantastic coincidence, like a Baumgartner who fathered a son out of wedlock in the line since John Carles Brown, to shake the conclusion. Thank you for sharing this amazing piece of research and writing - I am convinced, too! Great story! Thanks for sharing it. Maybe it wasn't a scandal, but rather a simple desire to have a name that sounded more "American". Fun story! I grew up in Idaho and completely understand why he changed his name. No one could spell it or would even try. Unless he was with a group of similar immigrants in a small town, he was better off going with something short & easy. Also as a very young man, it's better to blend in rather than calling attention to yourself & finding conflict you didn't want. If you kept your head down and worked hard, nobody bothered you. Everyone, thanks so much for sharing my enthusiasm about this find, and for the kind words as well! By searching forward through his siblings' family lines over the last few weeks, I found the names of some of Charles Baumgardner's (aka John Charles Brown's) living descendants. Then, using Facebook, I've just made contact with one of them -- a descendant of Charles's/John's older brother Harvey Baumgardner. It will be great to hear what her family line knew of what became of Charles/John, and exactly when he dropped off the radar -- and who he was known as at that time. This is such an amazing story of sticktoitiveness that major congratulations are in order. HEAR, HEAR! Your use of every single scrap of evidence from obscure or rarely used resources should be an example to all genealogists. The fact that you have even used DNA testing to confirm your hypothesis is fabulous. I would like to have your permission to clip a paragraph or two to publish a blog post on DNAnews.org, with a link to your original post. Looking forward to further details that I know you will find on your BAUMGARDNER family. 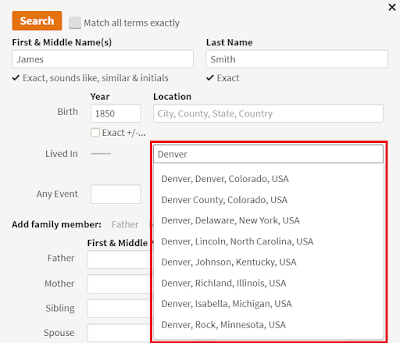 For several years, I have used your exact procedure searching censuses, etc, for women who have married/remarried and their new surname is completely unknown - putting in search perameters for first name (and even initials)only, age, place of birth and parents' place of birth. An uncommon first name creates quicker results. This procedure can also be used for young children whose mother has been widowed and remarried, and indexing errors have them placed under wrong surnames. Randy - That's a wonderful story. I had a very similar brick wall with my grandfather which was finally broken when I received a letter from a relative who knew the secret. My GF had left his first wife and child, run away with my Grandmother, and started a new family under a new name. I have been in touch with descendants of his first family but we haven't done any DNA testing yet. Your story has inspired me to follow up on that before it is too late. Excellent work, Randy, and a great read as well. My GGGrandfather has a somewhat similar pattern to your Charles. He variously told census takers that he was born in Louisiana, then Missouri, ... but was recollected by my grandmother as having had an accent "from the old country". When I found him in Northeastern Kansas at the time of the Civil War, he is married to a young woman from Prussia, and they start their brood of kids. He is buried in that state beneath a Civil War headstone for his service. I also went to Family Tree DNA to leave my DNA profile for matching. A large surname group exists, but none match closely enough to be related to my line. DNA matching is like fishing, ... leave the hook in the water in hopes you get a strike! I've advised my nephew, brothers and male cousins as well in the event I'm not here to see the match in person. Hopefully we'll catch Henry one of these days, as you did Charles. FTDNA provides an option to assign a beneficiary for your DNA. If you should pass, your beneficiary can take over the project. We have a few 12 marker testers who died before we knew about this option. We can't upgrade them. So - everyone - designate a beneficiary for your DNA project while you can. What a great story. I had something similar with my grandfather on my mother's side, who when he came to Canada in about 1907, chaned his surname from Spong to Clarkson. No one in Canada knew the truth and he did his best to keep it that way. My mother and her siblings never officially learned the story. All I knew was a suspician of the name Spong that my brother had, that he talked about the Manchester area of England, that his father had run a pub and that he himself had served in the Boer War, where he was injured. I was able to find a Spong family in the British census where the father listed his occupation as a pub owner and the name of his oldest son was the same as my grandfather. I was able to find more on a British site for soldiers from the Boer war, and he was listed due to his injury. This gave me his military number, which then enabled me to obtain a transcription of his complete military record. Since he had been shot through the cheek, my brother could remember seeing the scar (he died in 1956) Subsequently, a cousin found a letter he had written to his sister in Englend, under her married name, to verify his identity under his new name, so he could obtain insurance in Canada. So we finally had him identified, about 50 years after he passed away. Since then, we have been able to go backwards on his Spong history in England and Ireland and identify two generations back. Randy, I've known Baumgartners who were Jewish so I did a search at www.dogpile.com for jew* harassment new mexico and found info at this link: http://www.cabq.gov/humanrights/public-information-and-education/diversity-booklets/jewish-american-heritage/jews-in-new-mexico It mentions some families (no Baumgardners) who were German-Jews who usually went "back East" to Philadelphia to get their brides. Maybe your Robinson brothers had changed their name from Jewish sounding names to "americanized" names. It appears that it was not legal for Jews to live in the New Mexico Territory befor 1848. Maybe the Robinsons had arrived there before that time. maybe John Clarles Baumgardner changed his name because the family of the girl/woman he fell in love with didn't like Jewish people? Thank you for this very enjoyable case study. You really followed up all leads, even the ones you thought would have negative results. You checked all your sources and looked for further verification. There was a lot of anti-German sentiment in the US even as early as 1880. A 2nd cousin of mine did not know that there was "any German" in his family, even though both his maternal grandparents were born about 1860 in Wisconsin to German-born parents. My great-grandfather told his German-speaking wife not to speak that "dirty German language". She died in 1909 so this would have been before WWI. Loved the tale and result, hope it inspires many others to persevere and use DNA testing,we have brickwalls in our search in Australia but we will keep going. Thanks for the story.